More than 300 students gathered in front of Minister of Education Line Beauchamp’s Montreal office on Oct. 6 in preparation for the massive rally against tuition hikes set to take place in the city on Nov. 10. The rally was assembled by the Coalition rÃ©gionale Ã©tudiante de MontrÃ©al, a group that includes most Montreal universities and CEGEPs. The protestors planned the event to remind Beauchamp that the battle against tuition hikes, announced last March by Finance Minister Raymond Bachand, is still alive and growing. 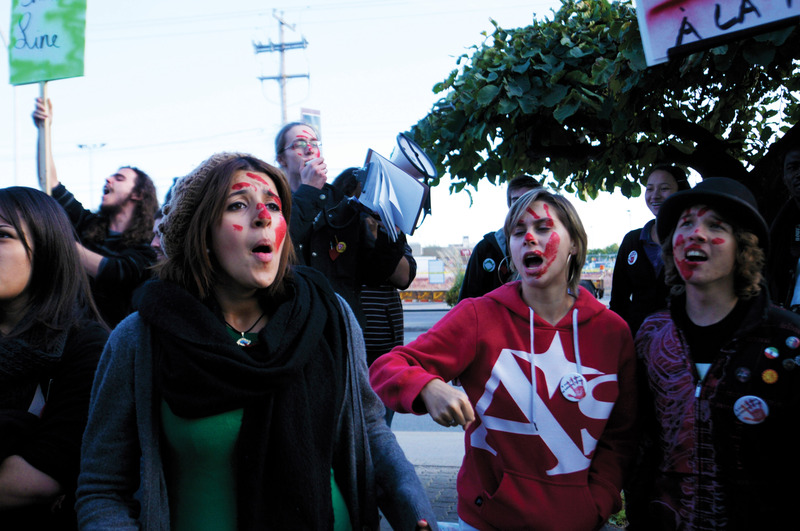 Walcott heads the Mob Squad, a CSU-organized group which has given itself the mandate of staging protests and demonstrations against tuition hikes. The squad was behind the release of 1,000 red balloons in the Hall building on Sept. 28, where each balloon represented 30 students who will not be able to afford to go to university if tuition fees are increased. During the protest, speakers from various schools took the microphone to shout their own personal message to Beauchamp in French and English. Student union representatives are hoping that this protest movement will not only block the hike but also, through this “common battle”, empower students and create a stronger sense of community within Concordia. “I believe that if we could gather 5,000 Concordia students for November 10, it would have a massive impact and be a huge accomplishment towards a stronger school spirit at Concordia,” said Walcott.